What do you think? Does this wreath say happy! 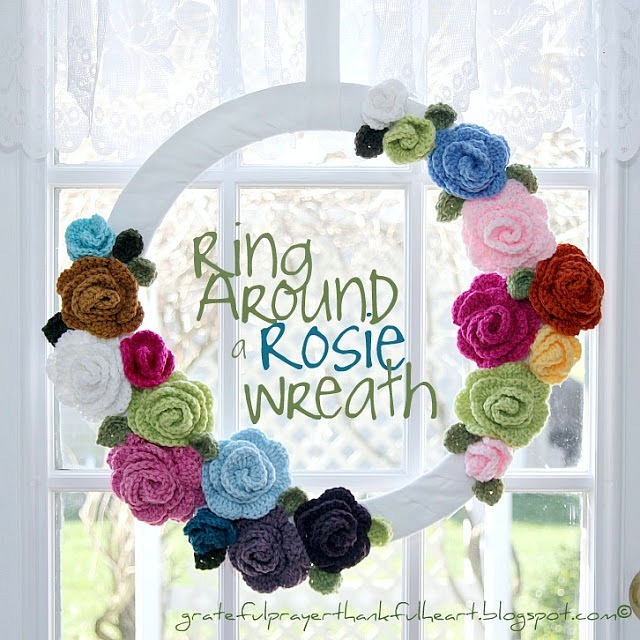 Easy to crochet rosettes in several different sizes are attached to a wreath form. Tuck in some crocheted leaves and you have a cheerful Ring around a Rosie wreath to brighten your world. From an easy pattern that works up quickly. Do you like an explosion of color? Or, do you prefer a palette of complimentary colors? Maybe neutral shades of tan or gray might be your choice. You will achieve a different look and tone by the yarn color you use but your finished wreath will be lovely. These roses were made following a free pattern from Lion Brand Yarn. I was going for a whimsical look so used many colors for the rosettes. Plus, I wanted to use yarn already in my stash. The finished wreath reminds me of a garden of wild flowers in their various colors. There are many styles of wreath bases to choose from all giving a different look. Grape vine wreaths might look nice with yarn rosettes in earthy colors such as green, burnt orange or other autumn-like shades. Straw wreaths would be a great backdrop for the neutral yarn shades. Wire frames, though probably not the best choice, could be covered with fabric or other medium. Be creating and imaginative with what you have on hand is usually how I roll. I went with a floral craft ring that is flat wanting a plain white base for a clean, uncluttered look to contrast with the busy and colorful roses. I bought a flat wooden circle wreath (18-inches) and painted it white. When the paint dried, I wrapped it in strips of white fabric (actually strips cut from an old oxford men’s shirt). Hot glue is what I used to attach the rosettes to the wreath base. It dries quickly so attaching the wreath components is a snap. But you can use other glue if you already have it. Fabric glue is a suggestion. For my wreath, I crocheted mostly the medium size (ch 35). I made some buds by following the ch 17 and just one big one (the bottom pink one). You can do any combination you like. G crochet hookCh 17 (35, 53). Thread needle with tail and weave to base of last st. Starting at that end, roll first shell tightly to form center bud; anchor at base of shell with 2 sts. Roll remaining strip to form Rosette, then secure by stitching in and out through layers of foundation ch at bottom of Rosette. If you want to make your Rosette a pin or barrette, sew or glue pin back or barrette back to back of Rosette. dc,trc,dc,hdc,sc,slip stitch in the last and finish off and tie ends. So wishing I knew crochet lingo right now. I WANT and need to learn how to crochet….I feel so left out. Hopefully I'll find someone to teach me. I'm a hands on type of girl!!! Love your work! Your wreath has been featured for Functional Friday! I love that you have a Bible in a year app on your site. A beautiful wreath! Thanks for linking up last week at whimsy wednesday! Beautiful! I love all the bright colors! The crochet rosettes remind me of my grandmother. She loved to crochet. Beautiful! I love the crochet flowers! This is a great project! I love the colors you chose for the flowers. Would you consider linking it up to my Pinworthy Projects Linky Party over at Just Us Four? That's a very cheerful wreath. Ok, such an awesome, beautiful wreath. I haven't crochet in while but I really think I could pull the flowers off. The flowers are so very pretty. You also gave a really great tutorial. Thanks so much and thanks for sharing you creative inspiration over at Sunday's Best! love how the flowers turned out! What a great tutorial. Awesome Tutorial. I'm pinning. Thanks for sharing this with us this week at the Sunday Round Up Link Party. Oh I love love love it!!! Thanks so much for posting at my Link Party. Hope to see you back again next week. Enjoy your day! That is an amazing wreath! 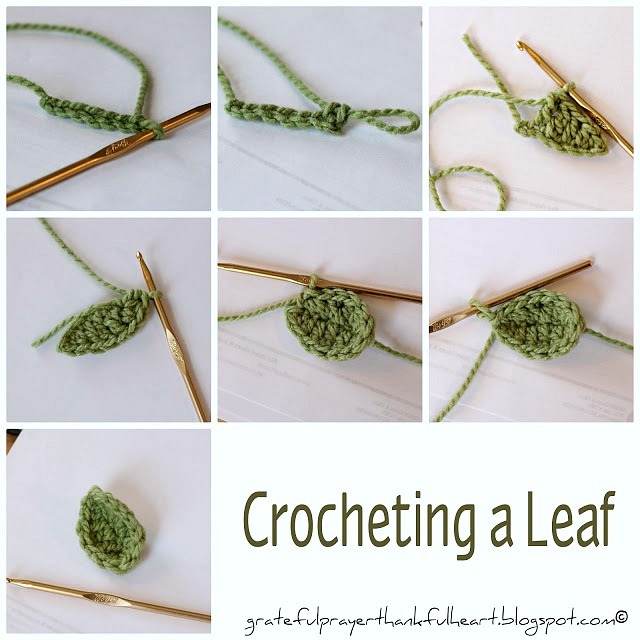 Not to mention a great crocheting tutorial! I'm your newest follower! Would love if you stopped by and linked up to the Pomp Party! How cute is this wreath! If i could only knit…sigh. Oh well, at least I have fabulous pics to look at. You did a fantastic job. Thanks for providing such happy eye candy! Have a fantastic weekend! That is beautiful! I love making crocheted flowers. I might have to try this. What a beautiful wreath! I would love for you to come share at my link party if you have time! this is beautiful. I would love if you shared it with my readers on my link party. 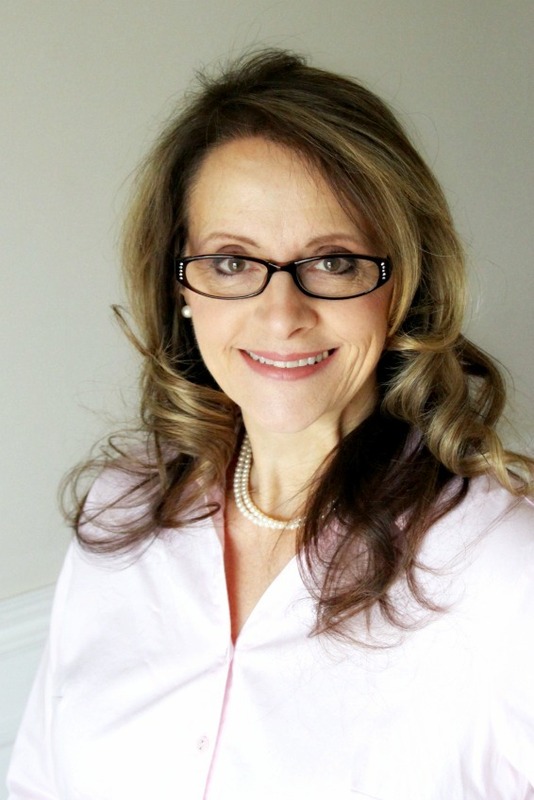 Dear Lorraine, knowing your blog, your creative ideas, practical ideas for cooking was a gift of heaven to me … I will keep visiting your page because I have much to learn from you. Oh yeah, congratulations on your beautiful family and his Christian faith. It is a blessing to meet wonderful people like you. Yes, it certainly does say HAPPY to me. Thank you for visiting my post on My Mink Stole and for your sweet comments. Oh darlin' it simply sings spring sweetness!!! It's beautiful! H A P P I N E S S here! Oh I think it is so much fun. Generally, I hate how things like this collect dust and it's hard to keep them clean, but this is worth the upkeep necessary to provide happiness! Love your talents. Yep that wreath says 'happy' to me! happy and beautiful! This is beautiful you always make me smile. So happy to be here visiting you again, I have enjoyed catching up on all your wonderful posts, Hope you have a great day my friend. The wreath looks great….I've used that pattern a lot, too!!! Thank you so much for sweet words on my blog:) Im so happy you liked it. Love the colors of your beautiful wreath! You are such a creative lady! Wanted to let you know, too, that the Cleome seeds you shared are sprouted and growing happily in my greenhouse. Thank you for sharing at my Seed Swap! I really need to take some time and teach myself how to crochet. We've been very slow at work…maybe the boss will let me practice stitching in the office!! So beautiful and yes… definitely says 'Happy'! Indeed it does say "happy" LDH, and you are so gifted, I like the idea of using discarded shirt to wrap it, great idea. I also love the colors you have chosen. Than you for sharing. BEAUTIFUL! 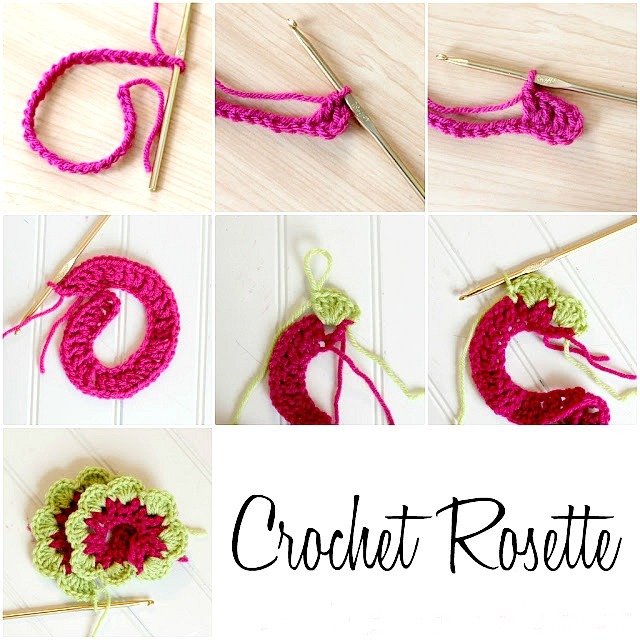 You make it look so easy to do those little flowers…I will have to find my crochet hook and give it a try! What a bright way to start the day! Just gorgeous and the white wreath sets the rosettes off beautifully! Thanks for sharing and all the details. Yes, it says Happy! Your post makes me want to try this!! Very sweet! I love it.